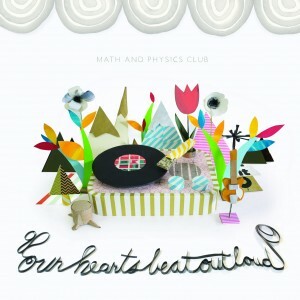 'Our Hearts Beat Out Loud' is the third studio album from our favorite North American pop stars Math and Physics Club, and their first since 2010's sparkling 'I Shouldn't Look As Good As I Do' LP. The new ten song collection is the band's most dynamic to date, confidently expanding their palette of subtle, literate pop and sprinkling it with hints of country, dub, distortion, and Graceland. Ethan Jones, the band's bass player and resident multi-instrumentalist, co-produced the album with Bob Schwenkler at Olympia's fabled Dub Narcotic Studio. Their goal was to make an old fashioned album with two sides, taking advantage of the studio’s vintage analog equipment to get away from the sound of digital perfection and instead sound like a band playing together in a room. The first single, 'Long Drag,' is surprisingly groovy with its schoolyard beat and staccato handclaps. The song was originally recorded as a straight-ahead rocker, but after playing a cut-up dub version for some friends the band decided to keep it. More surprises follow with 'We're Not Lost,' a brooding anthem to teenage heartache with its angular guitars and snap-tight drumming. Meanwhile, 'My Crooked Arms' strips away the drums and bass to reveal an emotional core of raw lyrics and guitars, accented beautifully by cello. For you vinyl aficionados, side two opens with 'We Didn't Run From Anyone,' a country-leaning ballad about love on the rocks (what else? ), with Ethan's gentle fingerpicking and breezy organ setting the scene. The album closes with a dramatic one-two punch. 'That's What Love Is' is a classic jangly rocker that's sure to please the most ardent anoraks with its shades of Brighter, while the album's final surprise, 'Road Carry Me Home,' is a lovely piano and cello driven heartbreaker. If that wasn't enough, the sleeve design features stunning papercraft artwork by Brooklyn artist Tae Won Yu that particularly shines in the larger vinyl format. As 2014 will mark ten years since we first fell in love with Math and Physics Club, 'Our Hearts Beat Out Loud' shows they can still surprise us. Available on CD and limited edition LP at finer record shops everywhere.